First Presbyterian has been straddling two campuses: their historic Kings Campus where they primarily hold traditional worship and Sunday School, and their new Grissom campus which is home to their fellowship hall, preschool and primary administrative office. Taking the next step in their master plan, a new 800-seat sanctuary and education/music wing will allow them to consolidate all activities on their new campus and sell the Kings campus. 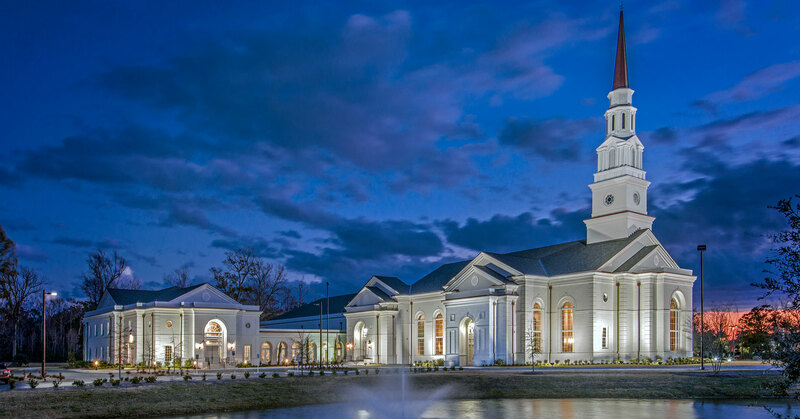 Blending with the distinguished traditional white brick of the first phase, the new sanctuary will sit front and center with its steeple rising as a beacon along Robert Grissom Parkway. The Myrtle Beach architecture firm of Mozingo+Wallace designed the first phase and BOUDREAUX is honored to be collaborating with them on this effort.